A full-feature tool packed into compact dimensions - that's the Leica DISTO™ A2 available from Merlin Lazer Ltd. The device sits comfortably in your hand, and the layout of the controls is designed to ensure fast and easy operation. As with all Leica Disto laser distance meters, the laser dot is clearly visible so that you can aim exactly at the point you wish to measure from, even in places where access is difficult. Shortcut keys for addition and subtraction, as well as for surface and volume calculations, mean that measuring could not be simpler. The illuminated display makes it easy to take measurement readings even in total darkness. 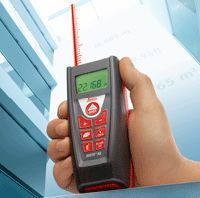 As a special feature for indoor use, the device comes equipped with a “stake out” function for measuring constant distances. Get Leica DISTO™ A2 - and you'll never have to carry a tape again. Leica Geosystems is also launching the Leica DISTO™ A6 at the same time as the entry-level model. With wireless data transfer via Bluetooth®, free software designed to let you export your data in various software programs (e.g. Word® Excel®, AutoCad®), an integrated viewfinder and a unique multifunctional end-piece, this device is the first choice for a wide range of situations, both indoors and out. Leica DISTO™ offers the right device for any type of application. Thanks to high quality and reliability, Leica Geosystems is able to offer a two-year warranty on all Leica DISTO™ units. The Leica DISTO™ A2 will be available from mid-late July - To pre-order your DISTO™ A2 and be one of the first globally to own one simply contact us on 01892 654141 and speak with one of our Disto trained sales staff who will also be happy to answer any questions regarding this tool or other models in the 6th Generation Leica DISTO range.